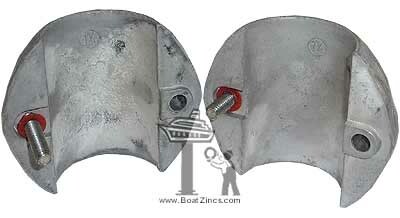 All aluminum shaft anodes have interlocking halves and extra alloy around the fastener. Models X-1AL thru X-9AL have two stainless steel allen screws. Models X-10AL thru X-19AL have four stainless steel allen screws. Stainless steel nuts are pressed in, and plastic retaining washers ensure that the screws do not fall out during installation.